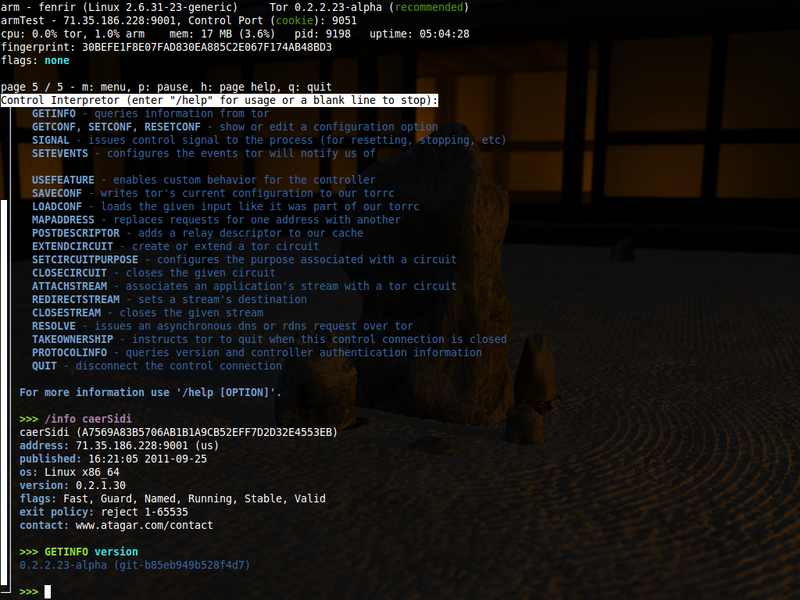 Nyx is a command-line monitor for Tor. With this you can get detailed real-time information about your relay such as bandwidth usage, connections, logs, and much more. Nyx's latest version is 2.1.0, released January 12th, 2019. 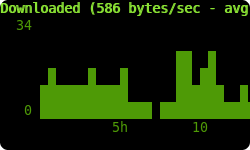 Bandwidth used by Tor. You can press 'i' to pick the graphing interval, or 's' to show other usage statistics. 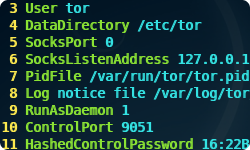 Tor logs a wealth of information about itself. We present it, colorized and deduplicated. Press 'e' to select what events are logged and 'f' to filter to just what you want. Connection data similar to netstat or lsof, but correlated with Tor relay information to make it much richer. Press 'enter' for more details, 's' to sort, and 'd' to see raw descriptor data. Editor to change Tor's setting on the fly, with usage information from its manual. Press 'enter' to change Tor settings and 'w' to write your changes to disk. Provides your torrc with line numbers and syntax highlighting. Comments can be stripped by pressing 's'. Integration with Stem's interpreter, providing raw controller access, irc-style commands like /help, tab completion, history scrollback, and a python prompt. That's just the tip of the iceberg. All pages within Nyx provide help information when you press 'h' and menu in response to 'm'. So go explore! 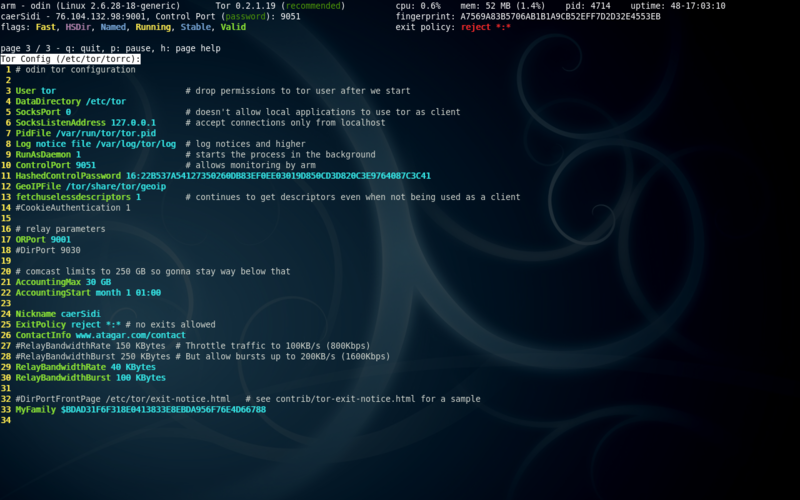 Nyx is a command-line application for monitoring real time Tor status information. This includes bandwidth usage, logs, connections, configuration, and more. 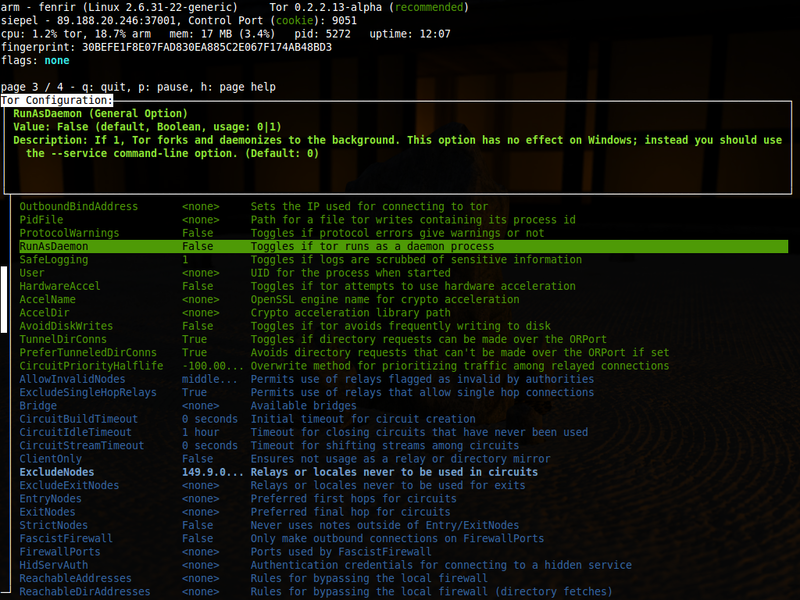 As a curses interface Nyx is particularly well suited for ssh connections, tty terminals, and command-line aficionados. For a bit of its history see my 2009 interview by Brenno Winter. Getting started with Nyx is easy! Open a Tor ControlPort for Nyx to connect with. Run "nyx" on your commandline. That's it! Why is it called Nyx? 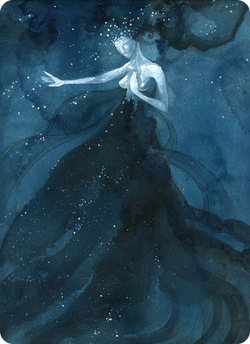 Simple - because the Greek goddess of night is short and memorable. Terminal applications are handiest when they're brief and easy to type. Top, ssh, scp - anything longer is just begging to be aliased down. Does Nyx have any dependencies? Yes, Nyx requires Stem 1.5.4 or later. What Python versions is Nyx compatible with? Nyx works with Python 2.7 and greater, including the Python 3.x series. Are there any other user interfaces for Tor? Yes, though sadly this space doesn't get much attention. 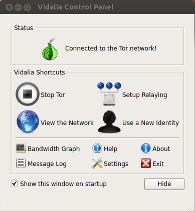 For years Vidalia was the default interface of Tor until it was replaced by Tor Browser in 2013. Vidalia includes a launcher, settings editor, map, and more. TorK is similar, providing connection information as well but never reached the same level of prominence. Both interfaces are now unmaintained. If I missed any then please let me know! Why can't I install with apt-get? If so, Nyx is not yet available in your distribution's repositories. Nyx is present in Debian Sid and Ubuntu 2.0.4 (Bionic), but it will take time before it's available elsewhere. In the meantime if you see the above we suggest installing with 'sudo pip install nyx' instead. Go to our bug tracker. Summary: Brief description of your issue. Description: Detailed description of your issue. Please provide steps to reproduce your issue, stacktrace if you got one, and screenshot if applicable. What license is Nyx under? Nyx is under the GPLv3. Will I see other people's traffic? No. Potential client and exit connections are scrubbed of sensitive information. Be aware that it's highly discouraged (and likely illegal) for relay operators to view other people's traffic, so please don't. Is it harmful to share information I see? Not really, but show some moderation. Screenshots of Nyx are unlikely to do any harm but try to avoid exposing data en mass. Can running Nyx leak data? No. As a passive listener Nyx retrieves everything it needs from your local system. Nothing goes over the network. Why can't I see the bandwidth graph? Is bandwidth graphed in bits or bytes? Bytes. Most tools measure in bytes so for consistency we do the same. Unfortunately hosting providers advertise in bits to inflate their numbers ("5 Mbit connection"). If graphs show just one eighth of what you expect this is why. Why are there borders like 'mwqqqqqqqqj'? When alternate character support (ACS) is unavailable borders become characters like the picture above. This is a terminal bug. Why can't I see Tor's connections? Nyx can provide you with information about tor's active connections. This information is retrieved from your system's /proc content or tools such as netstat and lsof. Unfortunately Tor inadvertently breaks the tools Nyx falls back to through a featurure called DisableDebuggerAttachment, which makes tor's process memory only readable by root. Use Nyx without connection data. Nyx does not require connection information, and aside a sparse connection list you probably won't even notice. Run Nyx as root. This is not recommended. Don't fret overly much about this decision. Nothing at play here is important - connection data is unimportant and DisableDebuggerAttachment's security benefit is insignificant. Either decision is fine. Why are connections missing relay details? Nyx presents your active connections correlated with tor consensus data. This means that in addition to the IP/port we also provide Tor-specific information such as your connection's relay fingerprint, nickname, contact address, and much more. However, sometimes this extra information is missing and that's fine. Relays publish information about themselves on an hourly basis in documents called descriptors. 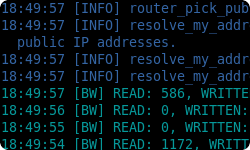 Tor downloads only the descriptors it needs to run, so Tor may not have information about all the relays you're connecting to. And that's ok. The best way of getting involved with any project is to jump right in! In particular look for the 'easy' keyword on our bug tracker for a handy spot to start. Find a bug or feature that sounds fun and dig in! Nyx has unit tests that exercise our curses functionality. When you run the tests you'll probably notice your console flicker as these tests are exercised. This is normal. Testing also runs pyflakes and pycodestyle in the background. How do I file a pull request? Make a publicly accessible repository for me to pull from. If you don't already have one GitHub is great for this. I'll review your change and give suggestions. When we're both happy with it I'll push your change to the official repository. What is the copyright for patches? Nyx is under the GPLv3 which is a fine license, but poses a bit of a problem for sharing code with our other projects (which are mostly BSD). To share code without needing to hunt down prior contributors we need Tor to have the copyright for the whole Nyx codebase. Presently the copyright of Nyx is jointly held by its main author (Damian) and the Tor Project. If you submit a substantial patch I'll ask if you're fine with it being in the public domain. This would mean that there are no legal restrictions for using your contribution, and hence won't pose a problem if we reuse Nyx code in other projects. Nyx is available Mac OSX, Linux, and BSD but not Windows. Find your platform below to get started. For what's changed see our change log. Package maintained by Dererk for Debian. Use sudo pip install nyx if this doesn't work. Package derived from Debian for Ubuntu. Use sudo pip install nyx if this doesn't work. Package maintained by Juan for Fedora using dnf or yum. Package by Anthony Basile for Gentoo. Package maintained by Markus for Slackware. Port maintained by Carlo for FreeBSD. Port maintained by pascal for OpenBSD. Port maintained by Riastradh for NetBSD. Like many terminal applications Nyx can be customized through a configuration file. By default ~/.nyx/nyxrc, though you can specify one with nyx --config /path/to/nyxrc. data_directory ~/.nyx Location data is cached to. To avoid caching anything to disk specify 'data_directory disabled'. password Tor controller password. If unset you will be prompted for a password when one is required to authenticate. Use of this is discouraged. 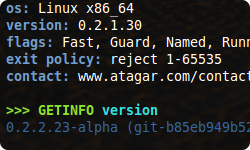 To authenticate with tor non-interactively please use cookie authentication instead. tor_chroot Chroot jail tor resides within. Most common on FreeBSD, if tor is running within a jail then use this to specify the path prefix we should use when looking for tor files on disk. show_bits false Shows bandwidth measurements in bits if true, and bytes if false. confirm_quit true Asks the user to confirm when pressing 'q' to quit if true. color_interface true Uses colors in Nyx's interface if true. Monochrome is false. color_override Replaces most color with this hue. Options available are red, green, blue, cyan, magenta, yellow, and black. unicode_support true Render text as unicode if true. Only ASCII is rendered if false. acs_support true Uses ACS (alternate character set) for nice borders if true. Borders are replaced with ASCII pipe characters if false. redraw_rate 5 Seconds to await user input before redrawing. connection_rate 5 Seconds between querying connections. resource_rate 5 Seconds between querying process resource usage. port_usage_rate 5 Seconds between querying processes using ports. NYX_ERROR Comma separated list of events to be initially logged, similar to the --log argument. deduplicate_log true Hides duplicate log messages. prepopulate_log true Populates with events that occure before we started. logging_filter Regex filter for log messages that are shown. write_logs_to Writes logs that occure as we run to this path. max_log_size 1000 Maximum number of log messages. graph_height 7 Height of the graph. max_graph_width 300 Maximum number of samplings. show_private_options false Shows configurations with a '__option' prefix. show_virtual_options false Shows unsettable tor configurations. resolve_processes true Shows processes for SOCKS and CONTROL connections. show_addresses true Shows addresses of connections. show_graph true Shows the graph. show_accounting true Shows accounting stats if AccountingMax is set. show_log true Shows the event log. show_connections true Shows connection information. show_config true Shows tor's configuration. show_torrc true Shows the torrc. show_interpreter true Shows the control interpreter. Relay tips? System administration question? tor-relays@ is a list of relay operators for relay operators. You can also contact Nyx's author. Want real-time help? 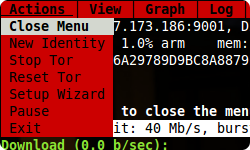 Give OFTC's #tor channel a try. Running into a bug? To report technical problems drop us a line on our bug tracker.